It has been a very intense two weeks at work. We have cases coming out of our ears as grass seed season has kicked in. We have started to get people walking in with their poor pooch shaking their heads or rubbing their eyes or licking their paws. It is only the beginning of this very frantic schedule we will be faced with any day now. Personally, the hardest part about this frantic season is finding the time to manage challenging cases, following up on ongoing cases & answering to all the demands of the public. I have been flustering my clients with my very late night calls about their pet’s blood results. There just seems not to be enough time in the day for me to do all my calls. We can only strive to do out best and we have to triage our bookings to suit everyone involved: our patients, our clients and our sanity. We simply can’t treat everything all at once and if you are late for your scheduled appointment, you may have well and truly missed out. Worst part of these past few weeks is not the busy schedule but the fact that my colleague and I have lost a few very dear patients. We have also got a few that are not doing so well. There is absolutely nothing more traumatic than getting a phone call at the start of your morning with your client crying and informing you of the loss of her much-loved pet and your regular patient. I had consulted the specialist about ‘Oscar’ because he was not doing too well on the medications required for his condition and I was going to adjust his medications that very morning. Rest in peace my handsome Oscar. You fought a very hard battle and I will share your story with everyone in the near future. It is too soon for me to talk about ‘Oscar’ because my emotions are too raw at this stage. Below is a picture of him. He was a head nudger and absolutely loved to gently put his head on your lap. Oh I am sorry! I must be depressing everyone and I can keep going on and on about how tough it has been. I mean after reading what I just wrote, I sometimes wonder, why do I still do what I do knowing what I go through. Yes I have had big winners but the price is lack of sleep and never guaranteeing an outcome. You do your best to save your patient and put your heart and soul into it. You can’t help but get so attached and consequently feel mournful and devastated if your efforts have not paid off. Seriously I sometimes wonder why I don’t just quit and start a new career. I could aim for a job that involves less pressure, way better pay and most importantly one that is not so consuming emotionally, mentally and physically! Now let me tell you why I could never stop doing what I do. Yes I go through some serious rough patches but there is nothing more beautiful than saving a life or stopping the suffering of a pet. Last week, Blossom made my day. It was insanely busy. We were running around like robots trying to get everything done. I still found the time to snuggle up with Blossom and had her sit 0n my lap purring her heart out while I typed my history. She had been off her food because she was in so much pain when I first admitted her . 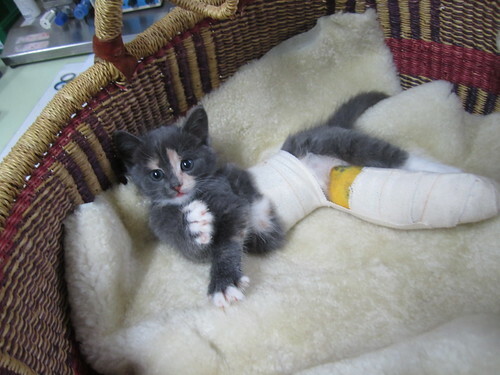 I discovered she had a swollen ankle and treated her appropriately. And voila, she ate heaps, was purring and grooming herself a couple of hours later. Today was a public holiday down under as it was Melbourne Cup. Someone had to be on emergency call and so Alana and I ended up sharing it. 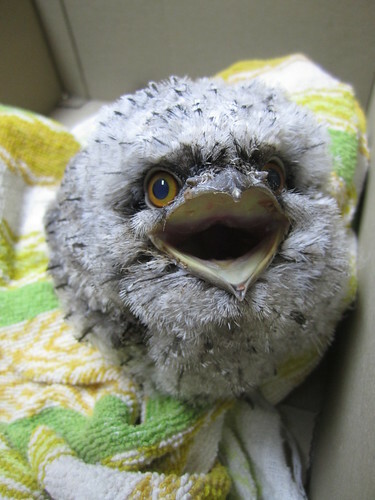 I was awoken at 7 a.m. with a phone call about a Tawny frog mouth. I instructed the lady to keep it warm and tuck it away in a box in a quiet room until I can organise for us to meet at the clinic. I am happy to do pro bono work for wildlife. At 10 a.m. when I had finished treating my in hospital patients, I called the lady and asked her to drop in the bird. I was shocked to discover it was a only a baby. I have only seen a handful of those at wildlife shelters. I was absolutely taken by him. He was starving and was attacking the box and I wasn’t sure if he was going to latch onto me. In fact, he was harmless but very vocal and demanding. We satisfied his immediate needs and will be sending him to a licensed wildlife carer in the morning. I feel very privileged to be involved in looking after such an exquisite creature. He looks like an owl and his beak appears small at first glance but when he opens his mouth, you are blown away by the sheer size of it compared with the rest of his body! I was feeling tricked and annoyed to be woken up so early about this tawny frog mouth but seeing him was an absolute treat. I’ve never seen ANYTHING like the little tawny frog mouth before! Brilliant. And dear little Blossom. So sorry about Oscar. Oscar’s picture just melts my heart. I am so sorry for his loss. 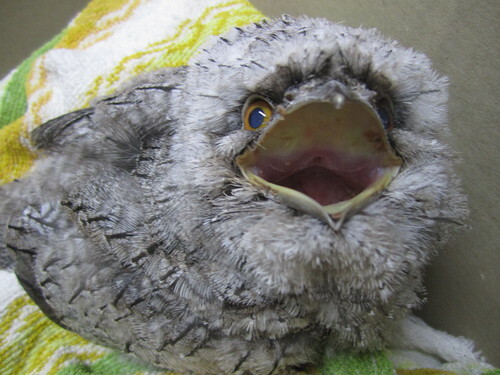 And the tawny frog mouth looks like a Muppet! So cute! i agree! 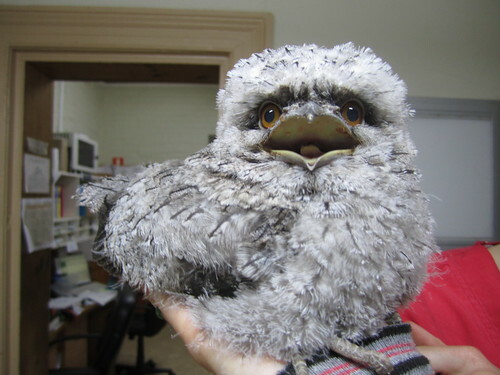 the tawny frog looks like a muppet! haha! so sorry about sweet oscar. his photograph made my heart sink. What a unique bird ! With it’s mouth closed, it looks more like an owl that we might see here in the U.S. They look like they have eyes as big as an owl though. Very interesting. It must have been Oscar’s time to go, but I can imagine how stressful it is not being able to wave a wand and keep all the clients healthy and happy. Still, each patient that is lost tells a story that may sometimes allow you to learn something new. Aloha cowboy 🙂 … Tawnies resemble owls but actually are more closely related to nightjars and oilbirds…they are pretty unique indeed… Oscar was definitely ready to go and was so brave until the very end… You can’t save every patient but you must always learn on what you could have done better…oscar definitely taught me so much and I will honor his memory via applying all that knowledge! Each season brings different issues depending on the country. Sadly, as our weather in Hong Kong improves, the incidence of tick fever sky rockets. Instead of battling itchy angry skin, we fight ticks that bring with them a parasite which destroys the red blood cells in our dogs. 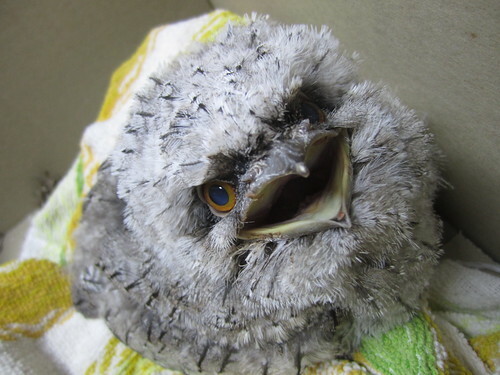 Thankfully though there are the moments like the Tawny Frog Mouth which remind us why we do what we do! Blessings to all who take the time to make a difference!! So sorry to hear about the loss of Oscar. It never gets any easier losing our furry friends and I can not even imagine what it would be like for you as a Dr. Your posts are wonderful and I can see the love and caring you have for each and every one of your clients. I had never heard of a Tawny Frog Mouth and at first thought it was going to be some sort of Halloween trick…lol What an absolutely beautiful, amazing creature. The pictures and the video are wonderful. Thank you for sharing! Oh, my he looks like a cuddly character from Sesame Street beautiful. Thanks for sharing him with us. Sorry to hear of your loss, Oscar must have meant a lot to you. Your job has many ‘downs’ as we see from following your blog Rayya, but the ‘ups’ far outweigh them – and this is why you do what you do. You love what you do because you love helping animals, no two ways about it. Job satisfaction at it’s best I would say! Sorry to hear about Oscar, but then Blossom’s picture was there to cheer us up – and then the awesome video of feeding the tawny mouth – wasn’t he just incredible? Thank you so much for sharing that with us. Lanny loo 🙂 … We sure shall miss our ‘frodo’… We fought over looking after him even though we were both exhausted, hehehe…he definitely boosted our spirits. Thanks so much for your kind comment:) I have to say I am so lucky I get to learn new things working with animals everyday and I really enjoy it! I bet you guys feel the same:) I love your blog by the way. It is just so cool logging on to your site every couple of days and seeing those animals reach thier final destination.. I especially enjoyed the one with the family who had 11 different pets! I will surely recommend you to all my clients down under:) please keep up the great work! Love the video and everything about your blog! Hey Bassa! I have to say I am so privilaged to be able to share this information with people who share my interests. I never expected to meet such amazing bloggers like you out there that are doing great things:) So please tell the tall person to keep posting those fantastics stories of you Bassa we all adore you!! The bird is beautiful. I guess eventually it will learn to swallow on its own? Another great post, Rayya. Do make sure you et some sleep and look after yourself too. First–my deepest sympathies on your loss. I look forward to hearing more about Oscar when you’re ready to share. That birdy-wonder, though, is something else! Wow–never heard of this creature before. How old? I’ve got to share with my parrot behaviorist colleagues, that’s amazing. Not quite the right place to ask this but I have looked all over your blog and cannot find any other way so here goes. My old dog is 15 years old and deaf. 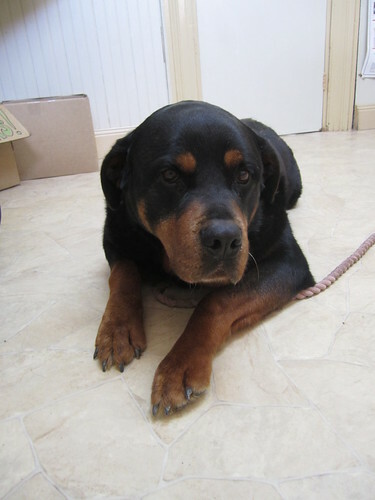 He has had a lump on his paw between his toes and my vet said that the swelling was caused through neoplasia and that he has a condition called Myxoma. She said that he could have an operation but I am not sure due to his age. May I ask your opinion? Is it really necessary? what is Myxoma? 1. Getting a fine needle aspirate & examining the sample on a slide under the microscope. This usually does not require any sedation unless the patient is too uncooperative. Unfortunatley some tumours don’t aspirate well and so I may see nothing & proceed to step 2. This usually give me a rough guide on whether it is imperative to remove the lump or not. 2. Giving a light sedative and collecting a punch biopsy to send off for histopathology to confirm the type of lump. Then based on the results, we decide if it is worth going back in to resect it especially if it is a nasty type of tumour. 3. Debulking the lump without confirming what type it is as best as possible & then either sending it away to determine if it was a complete removal or hanging onto the sample in formalin as we can always send it later if it comes back. 1. If the lump is growing rapidly > remove asap as it may be bad news. 2. If it is bothering the patient-licking it alot, getting infected alot, getting too big (almost going to rupture) > palliative resection to give the patient comfort! I always recommend performing a blood test on my geriatric patient to make sure his/her kidney & liver function is adequate to endure a surgery. If all appears ok or very mild abnormalities, then most of my old pooches & cats then have preanaesthetic iv fluids to keep their blood pressure up & it helps in their speedy recovery. Now are you sure the tumour is myxoma? I have honestly never had a patient with that type of tumour so can’t give you so much information about it. My research showed that myxomas in canines are commonly associated with joints. The prognosis is good even if they are not completely excised as they don’t usually spread. You can read this journal about myxoma but it is very medically based. Basically you and your vet need to have an open discussion on what you both feel is best for your dog. If the lump is bothering him, it is best to remove it while it is small. I hope that answers your question. Goodluck. Thanks for sharing! I can only imagine how difficult some days must be for you, because it is obvious how much you love animals, and you often have to see them suffering. I used to think I’d like to be a vet when I was younger, but I know that I am not emotionally strong enough. I cried when I had to bring my pet rabbit in for surgery on an abcess! But it is because you do what you do that people get to enjoy the long, healthy lives of their furry family members. So thanks for having the courage to do it every day! PS blossom is ridiculously adorable, and the Tawny too!!! Oh Dr. Rayya, I’m so sorry about Oscar, he looks like such a love. I can’t imagine the heartbreak you go through when you lose a patient. God Bless Drs like you who keep on doing in spite of heartbreak. 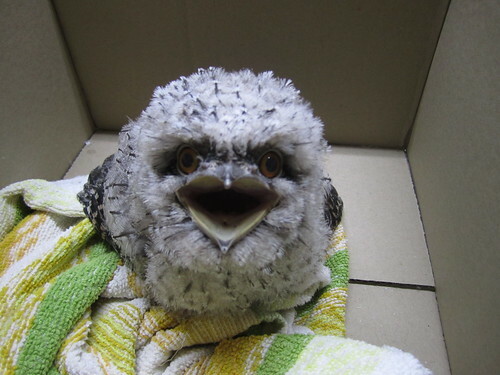 Your little Tawny Frog Mouth looked really hungry, but why wasn’t he swallowing the food. Was he too young to know what to do or did he have a problem?